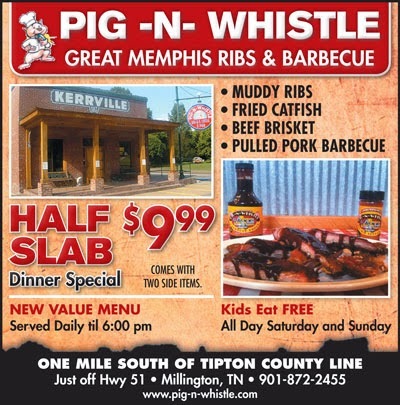 Pig-N-Whistle: If you’re stuck at the Millington Naval Base, this is the best stuff around. Its the old Kerrville, TN train station and its got a great old country feel to it. Its off of Highway 51 and has a good solid menu from BBQ Nachos to BBQ Sandwiches. I’ve been to lots of Hail and Farewell’s there, and I still stop in if I’m out that way. This entry was posted in BBQ, Millington by Trevor Knight. Bookmark the permalink.